Toyota upgrading Fortuner's brakes. Comparison pics added! Gave the car this morning for upgrading with new kit. Will be taking delivery this evening. Hoping for the best. Will be updating you with the results. The good thing is that the service advisor has atlast acknowledged that braking is a problem. 40K for a Fortuner Tyre! They are changing both the front discs to a bigger one and the calipers . I did not get the car back today. The brake dust seal (a small metallic ring which holds the seal together) has bend and as a precaution they are changing that also. Will give you the details of the parts changed soon. 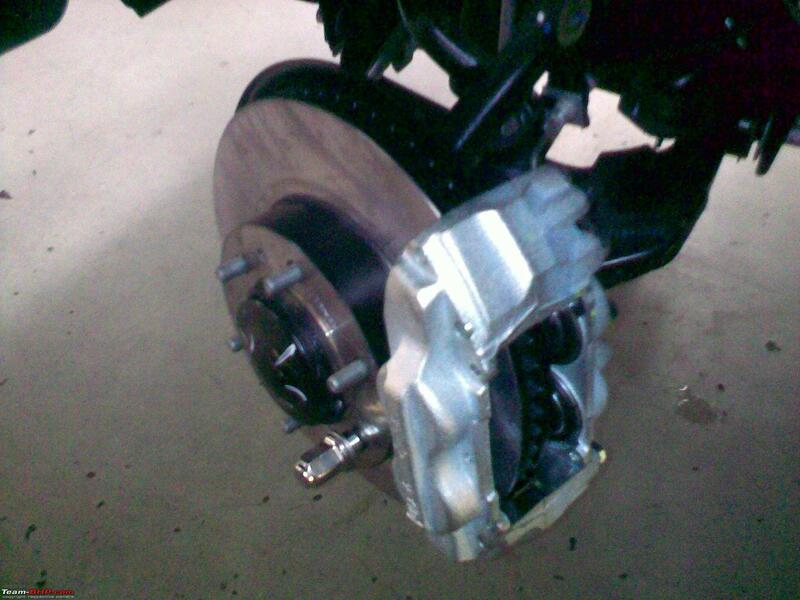 Here is the snap of upgraded brake kit. It looks bigger visually. When asked whether the fortuners coming now has the upgraded brakes, they said that they have not recieved any info regarding this. Mine has same front brakes. I saw them while replacing the cut tire. Dilip, considering that the front brakes do a majority of the braking work, this move was much overdue! Toyota MUST run a formal recall and ensure that ALL Fortuners sold till date receive a set of upgraded brakes. However, I still don't agree with providing rear drums on a 20 lakh automobile. That's just not done...all wheel discs are mandatory for an SUV of its size, price and power. However, I had driven the fortuner for about 50-60kms before getting my own and now I can indeed state that the upgraded brakes work like a dream especially when compared to the earlier scary setup. I have braked from speeds upto 130 kmph (i know its the running in period but our highways and new car enthusiasm to test brakes) and found no brake fade at all , unlike the earlier brakes that used to die suddenly. But I do agree that rear discs would have been much better. Is this a recall of all Fortuners sold till a particular date ? Or doing a selective replacement on customer complaints ? Coming at this time ,this reflects very badly on Toyota particularly considering the braking & acceleration problems on the Prius & other models. +1 to you GTO, Toyota definitely needs to come clean & do a recall ASAP to save its long term reputation. The Fortuner is sold elsewhere around the world, haven't they faced the same problems ? This can't possibly be a problem specific to the Indian market. ?? Untill the braking force available at the rear wheel meets the deceleration requirements for the vehicle of that class, a drum brake can do the job. Still drum brakes reduce the complexity in having a parking brake as compared to a disc brake system. Apart from this, the braking force on the rear wheel is far lesser as compared to the front wheels. So a larger disc naturally provieds more of braking torque (Torque = Force X Nominal radius of disc & Force = oil pressure X Caliper Area X 2 per wheel). I dont have to tell this to you as you are an expert, still its for learners. THAT is nice to hear. Toyota has finally accepted that the Fortuner has inadequate brakes. I do hope this is not a one off thing. They SHOULD upgrade brakes on all Fortuners sold till date (as GTO put it) & upgrade the brakes on the production line straight away. It would go a long way in restoring the brand image which of late has taken a beating Globally. Hey Dilip! can you please update us on the status of the new brakes being put on your Fortuner? did you get the delivery & are the brakes better than before? Dilip eagerly waiting for the update and the pics comparing the old braking equipment with the new one. Can someone please upload the mm and part number of the larger discs, pads compared tot he original? Just want to make sure that it is not some sort of hog wash being perpetrated by the dealer. Ilangop, there is a huge difference between brake force and braking force, did you mean brake force or braking force? Sorry for the late reply. I got the car only last evening. I had a chance to brake hard within 5 min of getting my car. There is a vast improvement over the previous setup. I now feel confident . The earlier spongy feeling of the brakes has reduced so is the play in the pedal. They should have done this in the first place. I asked them to allow me to take photos of the old brakes, but they refused saying that they don't allow photographing of parts which they changed under warranty. Strange reasoning, is it not ? Can anyone who has a Fortuner with old brakes take a snap so that we can compare the changes? It seems they do not want the other owners to know about this for obvious reasons. The invoice given to me mentions only 'BRAKE KIT'. The Service Engineer told me that KIT consists of a bigger dia Discs, bigger rotors, pads and pins[ which I didn't understand]. Anyway as long as the brakes work fine its ok for me. Through this forum we can definitely spread this info. The Service Engineer told me that KIT consists of a bigger dia Discs, bigger rotors, pads and pins[ which I didn't understand]. Anyway as long as the brakes work fine its ok for me. Through this forum we can definitely spread this info. Aren't bigger dia discs and bigger rotors the same? . Did the Service Engineer tell you this? All times are GMT +5.5. The time now is 12:12.